Perhaps the best action scene ever in a Bond film is a remarkable hand-to-hand scrap in a Shanghai high rise, elegantly shot in silhouette with a colourful neon advertisement in the background. It’s short but indicative of director Sam Mendes’ admirable modus operandi – brevity, judiciousness and evocative imagery – which help make Skyfall the most cinematic of all the Bond films. We finally have an interesting director at the helm. With that said, it comes after a series of increasingly disappointing pictures since Mendes’ celebrated American Beauty, so we can’t help feel the perception of his involvement as an attempt of career rejuvenation. Well, it worked. There’s an added skip in Mendes’ step, as he delivers a film with all the energy and aggressive action, as well as a sense of the cinematic, that is missing in every other Bond film. The idea of using only adequate technical directors to helm these now 23 Bond movies always irked me. Why did it take so long for the MGM and EON production team to realize film was a director’s medium, not a producer's? Tom Cruise, as producer of the Mission Impossible films, knew this. I guess the reasoning was that the franchise was bigger than the director, and that an auteur vision could scramble their money-making formula. The one-off success of Casino Royale notwithstanding, this ignorant view has resulted in a franchise continually stymied for creativity and freshness. Long gone is the usual opening circular frame of the gun’s viewpoint that traditionally opens these movies. Instead Mendes cuts right into his first action sequence, the theft of the film’s maguffin, a stolen file listing all the MI6 names and their aliases (not unlike the stolen NOC list in Brian De Palma’s Mission Impossible). As 007 chases the villain through the streets of Istanbul, it’s all monitored and controlled from London’s MI6 office via satellite surveillance. 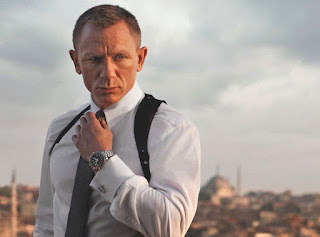 The end of the sequence sets up the film’s central premise, Bond as a rogue agent outside the comfort zone of the tech gadgetry we’re used to seeing – an organic, grassroots Bond, if you will, with only his wit and guile as his weapons. This concept plays out in several forms throughout the film – at first working as a missing agent presumed dead; then after a devastating terrorist bomb, which destroys their building, the entire department is forced to work in a WWII bomb shelter with Cold War-era tools; and lastly in the third act a retreat of sorts to a completely threadbare Bond, as he confronts his enemies in a Straw Dogs-like siege in isolation. Mendes’ employment of one of the world’s best cinematographers, Roger Deakins, is another signal of the reboot mindset of this Craig-era Bond. Casino Royale had already discarded most of the bubble-gum elements of the Brosnan Bond. But under Deakins' visual guidance we finally have a film with some memorable evocative imagery. The Shanghai action scene is most memorable, but Deakins' underwater imagery and the fog shrouded field chase in Scotland are emotional and haunting. And almost every action scene is directed with seemingly in-camera reality. Though there were hundreds of personnel credited with CG effects, for the most part computer effects were invisible to my eye – an admirable production constraint considering the ‘anything’s possible’ abilities of today's CGI. The final act is also an inspired climax. After a tremendous gunfight in downtown London, Mendes and his writers turn the film inward, engineering a smaller scale actioner, a confrontation which recalls the dramatic finale of High Noon or Witness, or as mentioned, Straw Dogs – references that complete Mendes' wholly cinematic Bond film.